The Dark Knight Rises might be the first summer blockbuster that could benefit from massive doses of Prozac. Darkly hued and mired in Bruce Wayne’s Imax-sized funk, this Batman movie sets a ton of anarchic violence against a backdrop in which a masked villain takes aim at Gotham, destroying it in bits and pieces before his hoped for finale, a nuclear explosion that will send the place shrieking toward oblivion. And if all that weren’t enough, billionaire Wayne also takes a hit in the pocketbook; he goes broke during the course of a 164-minute movie that includes — among what may be too many layers — a bit of corporate intrigue. For all of that, Dark Knight Rises has a riveting quality that’s bolstered by an encompassing and masterfully created sense of dread. Director Christopher Nolan packs his movie with dark forebodings that create a feeling of what might happen when the center no longer holds and chaos begins to reign. I’m still trying to figure out exactly what values Dark Knight Rises tries to uphold — if any, but there’s no denying that Nolan’s movie is daring, strange and, in its best moments, startlingly extreme. The opening parts of Nolan’s third and final installment of the Dark Knight series reminds us that Wayne has become reclusive after being blamed for the death of district attorney Harvey Dent, a rogue lawyer who, since his death in the last movie, has been wrongly lionized by the citizens of Gotham. They view Dent as a heroic crime fighter. Wayne’s devoted butler Alfred (Michael Caine) suggests that his employer quit playing savior to a forlorn world and begin living a fulfilling normal life. Wayne, of course, isn’t done with Batman, who resurfaces as dense clouds of doom begin forming over Gotham. The city has been targeted by terrorists. Before Dark Knight Rises concludes, these terrorists will have attacked the Gotham Stock Exchange and a packed football stadium, and for much of the time, Batman won’t be able to do a damn thing about it. About half way through the movie, he’s captured, transported to arid climes and thrown into an imprisoning pit. Put aside comic-book expectations. Dark Knight Rises would sooner rip out its tongue than plant it in its cheek. Even more than in the first two installments, Nolan strives to create an environment in which a battered world is about to be consumed by calamitous waves of terror. 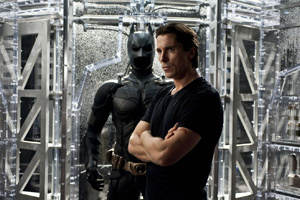 Christian Bale retains his hard-won title as the most most intense and obsessive of all Batmen. During the course of the movie, Bale takes the kind of beating that makes you wonder whether he shouldn’t follow these performances with long stints in an upscale sanitarium. Only Anne Hathaway’s Catwoman — a.k.a. Selina Kyle — hints at levity. Hathaway’s sultry sarcasm shoots beams of light across cinematographer Wally Pfister’s otherwise inky palette and provides a bit of contrast to Hans Zimmer’s doom-struck score. Some of the movie’s characters are familiar: There’s Caine’s Alfred, of course. Morgan Freeman’s Lucian Fox continues to provide Batman with his vehicular toys. Gary Oldman, as Gotham’s police commissioner, adds to the seriousness. Nolan does a first-rate job with the action, which is chaotic but comprehensible. The special effects (all manner of destruction) are well conceived. They pass in hurried review as Nolan creates feverish swirls of action, commendably avoiding the cliche of The Big Moment, grand entrances for Batman, etc. Perhaps to keep us unsettled, Nolan never gives this epic-sized movie a solid core, but focuses on an out-of-control society in which various forces contend for supremacy. A haunting sense of fatalism undergirds Dark Knight Rises, and there’s little to suggest that our battered species ever will run out of hideous villains. This time, the fiends aren’t nearly as distinctive as a Batman nemesis such as the Joker, but as Bane, Hardy exudes so much frightening authority, you believe he could turn Batman into a loser. In the end, it’s not so much the action-oriented excitement that makes Dark Knight Rises so compelling; it’s the tenacity with which Nolan clings to a forbidding vision in which nothing and no one ever feels truly safe.